It’s fairly common for manga to get anime adaptations after they’ve been published for a few years and have gained enough popularity and content to warrant a season or two. 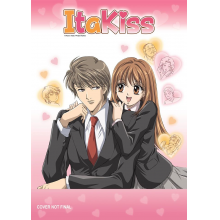 But sometimes studios and production committees choose to go back a bit further and animate older manga, which is the case with Itazura na Kiss. The manga ran from 1990 to 1999 but was cut short when its author passed away in an accident. However, with approval from her widower the manga continued publication and several live action television dramas were produced before the 2008 anime. It initially seems like your typical romantic comedy set up between a ditzy female high school student and the seemingly perfect high school guy, but unlike many of the others in the genre it goes beyond the high school timeframe as the episodes progress. However, the romance is dragged out to the point that many viewers may drop this show from frustration before getting to some of the best parts and that does make it a bit harder to recommend. Itazura na Kiss starts off with Kotoko Aihara giving a love letter to Naoki Irie. Kotoko is your fairly typical lead, as she’s fairly ditzy and doesn’t do that great in school but has a ton of energy and is often unwilling to give up. Her romantic interest is also stereotypical right from the start, as Naoki is the smart, handsome type who everyone around him regards as perfect. He’s also got quite the cold personality, and the first episode sees him outright rejecting the love letter without even reading it. Normally this would be the end of a romance like this, but in true genre fashion fate intervenes. Kotoko’s father recently built a new house for the two of them to live in (as her mother had passed away some years earlier), but it is shoddily constructed and the same day as the love letter rejection a small earthquake completely destroys the house. They are invited to stay with a close family friend, who ends up being the father of Naoki. With this set up in place, the two main characters begin living together under the same roof and a potential romance begins to blossom. My initial expectation was that this series would follow the fairly traditional romantic comedy set up, where the distance between the two would eventually break down over time after a series of mishaps and at the end they would get together right as high school was coming to an end. So I was pleasantly surprised to find that Itazura na Kiss moves at a bit faster pace than the norm. As you would expect, Kotoko and Naoki start off as far apart as you could possibly be and then the distance slowly breaks down until they end up together. But rather than containing the entire storyline to the high school environment, there are some time skips that move things forward to college and then later occupational training. This was a nice change of pace, as so many romance anime series tend to be confined to the initial romance stages and don’t progress too much further beyond them. Naoki and Kotoko remain the main focus as the storyline progresses, but there are quite a few side characters that are introduced as well. As Naoki is the cold, unapproachable type he doesn’t really have any friends, so the initial quarter or so focuses on Kotoko and her friends. Her main friends are Satomi and Jinko along with Kinnosuke, who is madly in love with Kotoko. Jinko and Satomi really don’t get much in the way of character development as the story progresses and tend to serve as comic relief, but Kinnosuke actually received a bit more screen time than I was initially expecting. He’s pretty much the exact opposite of Naoki, as he’s impulsive and over emotional and often times comes off as goofy. But what I like about Itazura na Kiss is that it doesn’t shove these competing romantic interests off to the side once their story arc is over, and it also doesn’t go out of its way to create a complicated love triangle either. As the series progresses viewers are introduced to Chris, a British girl who casually dates Naoki for a bit at the insistence of his father (she is the daughter of the president of the bank that finances Naoki’s father’s company) as well as nursing student Keita who tries to steal Kotoko away. Rather than simply introducing them as a plot device, the series takes the time to let viewers connect with these supporting cast a bit more and in some cases even when they fail to win in romance with one of the main characters they end up in love with another one of the secondary characters. My interest in the supporting cast made one of Itazura na Kiss’ main flaws apparent though, which is that the main romance between Naoki and Kotoko is often extremely frustrating for the viewer to watch. Even with pressure coming from Naoki’s nosy mother who does her best to pair the two of them together, other romantic interests, and Kotoko’s attempts to show her affection things don’t happen very quickly. Other romance anime/manga that has a cold, standoffish male lead have a tendency to use some kind of tragic backstory to explain why they act the way they do and make the viewer feel that if the female lead can melt the ice around their heart that they’ll both be happy. Naoki doesn’t really fit that, as he has a caring and supportive family and his only real excuse is that he’s been so focused on studying and trying to become a doctor/live up to his father’s role as a CEO that he lacks experience in romance. But this made it harder for me to connect with him as every scene had him going out of his way to openly ignore Kotoko or insult her in some way, even after they were together. It isn’t until almost three quarters of the way through that he finally realizes that completely ignoring the one he loves or coming off as openly hostile might result in losing her. Itazura na Kiss isn’t without its humorous and heartwarming moments, though the frustration viewers experience from the constant stalling of the romance may have some of them bailing out before they make it to all of it. Kotoko’s a decent lead and while she doesn’t quite have enough distinguishable elements to stand out as one of my favorite characters from a romance anime, there’s that same drive and unwillingness to give up even when it seems like she’ll never end up with Naoki that makes her an appealing character. There’s also a nice balance of humor and drama from the supporting cast, who are fairly quirky, and I liked the arc where a sickly boy that Naoki’s brother befriended returns as a snobbish teen actor and the main characters set him back on the right path. But you really have to stick with the series to get to these heartfelt moments, which could be a bit much for some people. I’m also curious as to why the original author used illness as a plot device on a regular basis, as every couple of episodes someone ends up in the hospital and creates additional drama. It appears that TMS Entertainment and the rest of the production team seems to have done their best to mimic the original art style of the manga, and seeing as it originally was published in the 90s this gives the animation a slightly older look. I wouldn’t necessarily say that Itazura na Kiss immediately looks dated, but even with modern studio tricks in place you can tell the original timeframe that the manga it was based on came from and that might take a bit of adjustment from viewers so used to the flashiness of many modern day romance/harem anime. Overall the animation works well, giving the right amount of emphasis to the characters and throwing in some of the exaggerated expressions to add to the humor when appropriate. It never goes over the top with any particular element and stays relatively consistent, which allowed me to focus on the story a bit more rather than continually marvel at the animation (which could be a positive or negative depending on what you look for in anime). As far as voice acting goes, Nana Mizuki and Daisuke Hirakawa did a great job of selling me on the lead characters, even if Hirakawa’s job was to make Naoki as cold and unlikeable as possible. The acting for the supporting cast is a mixed bag, with some coming off as humorous even when the scene calls for drama and others delivering a more balanced performance. It’s also probably better if we didn’t talk too much about Jinko, whose voice actress has one of the more annoying pitches I’ve ever heard. There is one opening theme for the entire series and two ending songs, and all three are lighthearted pop numbers that fit the overall feel of the series very well. If you’re willing to stick with Itazura na Kiss for its entire run there are some warm and fuzzy moments and a likeable cast of characters, but there are many points where the romance stalls so much and the male lead remains so icy cold that viewers may find their patience runs out. Based on some of the other reviews I’ve seen around the web it seems as though there are plenty of people who were able to do so and thoroughly enjoy the series, but this one just didn’t stick with me the same way that some of the other romance focused anime have in the past. Still, as the resident fan of this particular genre of anime I was happy to spend time with this over some of the more mindless series out there, frustrations and all.